One Unit Fits Any Size Opening for 16"-36"
Why Do So Many Businesses Trust SafeRack for Truck and Railcar Platform Systems and Maintenance Work Platforms? Years of Experience. 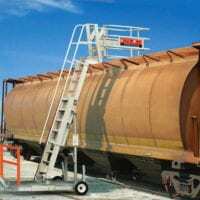 Our team has decades of experience working with companies that load bulk chemicals into tank trucks and railcars. Increased Productivity. 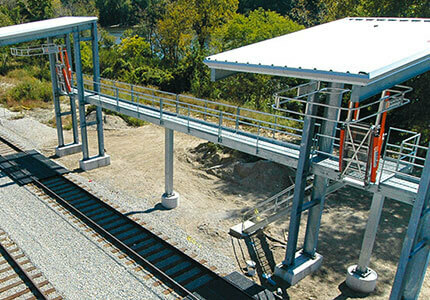 SafeRack systems boost productivity by providing employees with increased safety and better ergonomics while truck loading or railcar loading. Better Value. We deliver much more than a product made of steel and aluminum. We deliver increased ROI in the form of world-class customer service, advanced technology, quality designs and years of experience. Collaborative Approach. We coordinate with operations, safety and local engineering to provide a complete solution at bulk chemical loading stations. Fewer Complaints. We work with you every step of the way to ensure a seamless—and painless—process. And we’re always ready to help handle future questions or changes. Superior Service. SafeRack is committed to customer service. We listen, we ask the right questions, we’re onsite throughout the process and we always deliver more than an email, phone call or quote. SafeRack is excited to announce its newest brand, AeroStep, a specialized line of rolling stairs and access platforms for aerospace and aircraft industries. AeroStep’s rolling stairs have the stability of a fixed platform, but are highly mobile and can be precisely positioned against even the most delicate machinery. Excellent appearance. Easy to use. SafeRack product benefits are 1. Excellent appearance. 2. Easy to use. 3. Provides excellent protection for users.